Sixth edition, October 2001, added to my web site. This writeup was written when a friend of mine (Gordo) and I each owned 1991 Honda XR250L dual-sport motorcycles. Many, if not all, of the modifications described apply to subsequent model years also. Part numbers, part descriptions, vendors, and phone numbers were last checked for accuracy in 1996. If you find any errors, let me know and I'll fix 'em. So you just bought a brand new XR250L. Have you noticed how heavy it is? Have you noticed that it doesn't have much punch? Are you afraid to ride hard trails with it because the tires won't make it? Well all of these thoughts have occurred to me too. And I did something about it. My objective was to remove as many parts as I could from the XR-L and still keep it street legal. My friend Gordo wanted to turn his XR-L into an XR with shorter suspension that he could occasionally ride on the street. We both got what we wanted. My bike weighs 23 pounds less than when I started and has DOT approved tires that can be used on the street and off-road with some confidence. Gordo's bike weighs about the same as mine and has knobbies on it. Gordo uses his bike in the desert and in the woods. He doesn't plan to do much street riding, but he's legal in most areas and can ride on the street if he needs. The following pages describe in detail how we modified our bikes. Many parts from the XR250R (`86-`94) will fit the XR-L. These parts are sometimes lighter or give better performance than the XR-L parts. We used standard XR parts whenever we could. Working only on week nights, we each took less than a month to do all the initial work. We rode on the weekends to check our work. The biggest time delay was waiting for parts to be delivered. Cost is not mentioned much, but rest assured, neither of these project bikes was cheap. Gordo had a NASA budget, while I had a Kitty Hawk budget, so sometimes I didn't spend as much on mods as Gordo did. Gordo and I have "49-state" model bikes. We don't have an over-aggressive DMV in our state, and we can get by on a lot less than people in other states. If you think that some of the things we've done might not get by your DMV, then don't make the changes. There are more than enough things to do legally. If you are making a pure off-road bike, then have at it. Where I knew about the California-specific differences, I mentioned them. I'm sure that I didn't catch them all. At the end of each section is a list containing part descriptions, vendor or manufacturer abbreviations, and part numbers when available. The key to the vendor/manufacturer abbreviations is at the end. But, if you want to stick to the stock pumper carb, there are a few things you can do. The carb is jetted too lean. If you do any of the intake or exhaust mods, then it will be way too lean. Install a 128 main and a 40 or 42 pilot as a start (sea level jetting). While you have the float bowl off, remove the pilot adjusting screw. Be careful with the spring, metal washer, and o-ring. Heat the end with the small ear on it, and the ear will fall off. Reinstall the screw before remounting the float bowl. The pilot screw can now be adjusted throughout its range. There are too many hoses on the California model carb. If you don't need to be EPA legal, remove the purge control valve and canister and two extraneous hoses. Consult pages 1-22, 1-27, and 5-10 in the Service Manual to see which hoses to remove. Seal the holes in the carb body with short lengths of hose that have been plugged with shoe goo or something similar. You can seal the carb body directly if you trust yourself. Besides hoses, there are two other differences between the California and 49-state carbs: the part numbers are different for the throttle slide and carb top. I don't know the extent of the physical differences, but I would guess that the slide cut-away is different, and the carb top has a throttle limiter. If you want to replace the XR-L carb, get a "take off" carb from XRs Only for about $50. XRs Only takes parts off of XR250Rs before they mount special hop-up parts. The XR carb is a perfect fit because the carb bodies are identical. You will have to use the choke lever on the XR carb body and discard the XR-L choke cable. The XR carb is most definitely recommended if you do any of the intake or exhaust system mods. I have been doing some research on XR carbs as part of an effort to update this page. I started a new XR carb page, and there are now links from this page and my XR250R page that point to the new XR carb page. The XR-L exhaust is somewhat restricted. The exhaust header from an XR is about 3 mm larger in diameter, and will bolt right up to the engine. Gordo and I both installed XR headers. However, the XR-L tail piece/muffler will not mate with the XR header because the diameters are different. You have the following two choices. First, you can opt for an aftermarket muffler like a SuperTrapp, Cobra, or White Brothers Megalloy Exhaust Kit. Second, you can mount a muffler from a `90 or newer XR250R. These models have rear disc brakes like the XR-L, and their mufflers have a cutout to clear the disc brake when the suspension is compressed. Honda sells the tail piece/muffler for over $200. Sometimes XRs Only has "take off" mufflers for about $40, but be sure to get the `90 or newer muffler. If you use the Honda muffler, you may want to change to a large diameter muffler insert from an `85 XR350R. Alternatively, you can use the insert in the XR-L muffler by grinding off the weld. Good luck, the weld is plenty deep. I installed a `90 XR250R muffler with the large diameter insert that I removed from my now-ruined XR-L muffler. My bike seems peppier and revs out better than it used to, and it's still plenty quiet. I can install a small diameter insert to make it even quieter. The XR muffler is about 1.5" shorter and one pound lighter than the XR-L muffler. Gordo installed a SuperTrapp Racing series muffler with 8 discs, and it was very noisy. He had an insert made to fit inside the hollow middle of the SuperTrapp. This insert adds another layer of fiberglass insulation and quiets the bike considerably, but his bike is still noisier than mine. Gordo talked to the guys at SuperTrapp, and they told him they were planning to make a Street/Trail Series muffler for the XR-L. This version will be the 4" steel muffler with integral S bend like they make for earlier model XRs. Lastly, Cobra makes an aluminum muffler that fits the stock XR-L header. The inlet air tract is too restrictive. Remove the inlet air duct by drilling out the two pop-rivets that fasten it to the top of the air box. These pop-rivets will be difficult to drill out unless you can keep them from turning. Grind them off if necessary but keep the air box from melting by applying water to the rivets as you grind. Remove the internal metal brace by drilling out the pop-rivets on each end of the brace. Grind the middle off at the welds and leave the metal plate mounted in the air box, so you don't have to mess with holes in the back of the air box. Don't let the plastic melt; apply water during drilling and grinding operations. Replace the stock air filter with a K&N air filter. You can use the large capacity air filter for the XR600R, if you remove the metal brace from the air box. The larger filter is a tight fit and the stay arm must be bent a little, but it works. You can make a longer stay arm fastening loop from 1/8" welding rod and then the stay arm doesn't need to be bent. Remove the breather canister from where it is mounted on the left side of the frame by the shock reservoir. Remove the mounting tab from the frame. Disconnect all hoses from the canister. Remove the hose from the crankcase vent tube and install a K&N crankcase vent filter directly on the crankcase vent tube. Remove the hose from the left front of the air box and plug both ends of the plastic tube on the airbox with shoe goo. Remove the hose from the bottom of the air box and replace it with an XR air box drain valve. The stock tank is steel and will dent permanently if you fall on it very hard. IMS and Clarke make replacement plastic tanks. The IMS tank holds 3.5 gallons and comes in white or XR flash red (orange looking). The red/orange tank is semi-transparent and is exactly the same color as the seat and red/orange XR fenders. The tank mounts on the stock donuts at the front and has a trick metal bracket at the rear. You use the stock petcock. IMS provides a plastic non-locking gas cap (unlike the Honda 49-state metal locking gas cap). The tank does not feel any wider than the stock tank; most of the extra capacity is obtained by drooping the front and raising the top. The upper triple clamps just kiss the tank at full lock. The tank does wobble when you press with your knees. Clarke makes a 4.0 gallon tank with a very solid mounting system; a threaded rod passes through a pre-existing hole in the frame and the front of the tank. The tank is narrow at the back, like the IMS tank. I tried both tanks and liked the Clarke tank the best. I wanted to remove the battery because it was heavy and would make me fall down a lot. As it turned out, the entire battery box and battery weighed only 4.5 pounds, but I removed them anyway. I replaced the battery with a capacitor from Radio Shack. The lights and horn still work perfectly. The lights don't dim when the bike is idling or when you blow the horn. I'm happy. Thanks to Mark Lawrence of Nevada City, CA, for the capacitor information. Disconnect the wires from the battery and straighten the battery connectors. Dismount the fuse block and remove the wiring and fuse block from the battery case. You may want to wrap tape around the fuses and the fuse block or make a small case to hold the entire fuse block. Remove the battery case from the frame. Unwrap a few inches of tape from the wiring harness and remove the rubber battery box seal. Position the red and green wires that were connected to the battery along the capacitor body, running in opposite directions. The red wire goes to the positive end of the capacitor (indented ridge); the green wire goes to the negative end. Tape both wires to the capacitor to prevent strain from breaking the leads after they are soldered. Install heat-shrink tubing on all exposed wire. Run the ends of the capacitor leads through the straightened battery connectors and bend them around the connectors before soldering. Solder the leads and heat all the heat-shrink tubing. Cover the fuse block and capacitor assembly with a piece of bicycle inner tube. While you're in the vicinity, remove the kickstand switch and guard, and disconnect and remove the kickstand switch wiring harness. Carefully push the three pins out of the plastic connector that is part of the main wiring harness. Install heat-shrink tubing on the yellow/black lead. Solder the green and green/white leads together, cover with insulating tape, and wrap all three leads with the main wiring harness. Remove the wiring harness from the frame all the way forward to the junction in front of the air box and re-route the harness forward under the gas tank. Be careful not to cut any wires or bend the harness too sharply. Zip-tie the fuse block and capacitor assembly to the frame. One solution is to remove the headlight from the circuit during starting, so the capacitor will charge quicker, and the ignition circuit will work. On some street motorcycles, a voltage or current clamping device is used to keep the headlight off until the bike is running. An easier solution is to install a toggle switch on the low beam headlight circuit. You manually turn the switch off for starting and then turn it on when you want a low beam. I prefer to leave the light off to limit distractions in the dark woods. You can mount the toggle switch on either headlight nacelle side-support flange, and it will be protected by the number plate. Cut the low beam wire where it leaves the back of the bulb wiring and re-route it to the toggle switch. I mounted a miniature toggle switch right on the main light switch housing and cut and re-routed the low beam wire inside the switch housing. It's a tight fit. Just recently, I saw an ad for a White Brothers battery eliminator capacitor. The ad said the capacitor was for dual purpose bikes and no values were given for the capacitor. The Radio Shack capacitor works, with the modifications detailed above. Try what you like. I installed an EMGO tail light assembly in place of the stock assembly, which allowed me to remove the brace under the rear fender and save a lot of weight. I didn't use the supplied large rubber pad for the license plate; instead, I bolted the license plate directly to the rear fender. You'll need an extra nut and washer for the tool bag mount. The EMGO wiring harness is not long enough, and the ends don't match the XR-L harness. Cut and solder or use crimp hardware. Use shorter seat mounting bolts (8x12 mm) and shorter fender side mounting bolts (6x40 mm) to compensate for the reduced thickness due to the missing fender brace. I removed the rear-brake switch bracket and zip-tied the switch to the frame, which gets the switch out of the way of my boot. I drilled a zip-tie hole just behind the frame tube and between the rear brake mounting lug and lower passenger peg bracket bolt hole; it's in the perfect spot to hold the switch. Be careful when you drill because the brake line is behind the lug. For added protection, I fabricated a small plastic cover that mounts via a bolt in the lower passenger peg bracket bolt hole. Gordo made an aluminum cover. Gregg from California installed an Acerbis taillight. It's bigger than the EMGO but much smaller than the stocker. Gregg also installed Lockhart turn signals, which are very small, have short hard plastic mounting stalks, and fit on the stock brackets. The XR-L stock gearing is too street oriented for my taste. I wanted something more trail oriented, so I looked into various sprocket and chain combinations (see Sprocket Details on the next page). If you look at the chain guide rubbing block, you'll notice that it points down at the back. I think Honda planned for alternate gearing and a larger rear sprocket. I suggest that you consider the 43, 44, or 45-tooth rear sprockets, which work with the stock chain guide. I wouldn't bother with the 41 or 42-tooth rear sprockets because the drive ratio is too close to stock to be of much benefit. The 46, 47, and 48-tooth rear sprockets are too large. Gordo opted for a 48-tooth rear sprocket and had to make a chain guide lowering block. If you want the flexibility of changing back and forth between two final drive ratios without having to change chains, you should choose either the 43 or 45-tooth rear sprocket depending on the wheelbase and type of gearing you want. Then, to switch between street and trail gearing, you change only the front sprocket (12<>13). I put the 43-tooth rear sprocket on my bike. If you don't want to change the front sprocket back and forth and don't mind a fixed final drive ratio, try the 44-tooth rear sprocket. It provides a good compromise between trail and street gearing with either a 12 or 13-tooth front sprocket. 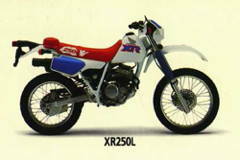 The 12/44 combination is almost identical to stock XR250R final drive ratio. The 13/44 combination is exactly midway between stock XR-L and XR250R final drive ratios. As Sprocket Details shows, the 44-tooth rear sprocket does not allow you to switch the front sprocket back and forth while staying with the same length chain. Note that the XR-L has the same transmission gear ratios as the XR250R for 1st through 3rd gears. The ratios for 4th through 6th gears are slightly higher (numerically smaller), so the XR-L is better suited to street riding regardless of the final drive ratios. If you choose the 12/44 combination, which is almost stock XR250R final drive ratio, you'll still have higher overall drive ratios in the upper three gears than an XR250R. The rear sprocket has the same wheel-hub hole and bolt mounting locations as the `87 XL250. However, because the XR-L has a cushion drive hub, the sprocket is machined one millimeter deep on the inside surface out to a diameter of 172 mm to compensate for the cushion drive offset. Sprocket Specialists is the only company making XR-L rear sprockets at this time. You can get their sprockets through XRs Only or through your local dealer. The front sprocket has the same size splines as the `88 through `91 XRs (`86 and `87 are not the same). Although the stock size for the XR and XR-L is 13-tooth, several manufacturers make 12-tooth sprockets for the XR, and they will fit the XR-L. The following table shows the final drive ratios for several sprocket sizes. 104 - stock chain length; both 12/40 and 13/40 sprocket combinations fit. 106 - short wheelbase; the table below shows usable sprocket combinations. 108 - long wheelbase, the table below shows usable sprocket combinations. 110 - Gordo used this length with his 13/48 sprockets. In the table below, the 'chain adjuster' columns show the chain adjuster setting. The 'slack' columns show the amount of measured chain slack. The proper slack is 20-30 mm. The 'fit' columns indicate if the chain is too loose or if the sprocket hits the chain guide because the chain is too short (hits guide). The 43-tooth rear sprocket and 106 link chain combination yields a short wheelbase and street biased gearing (using 44-tooth as the median). The 45-tooth rear sprocket and 108 link chain combination yields a long wheelbase and trail biased gearing. When I checked the clearance initially, I found that the sprocket hit the chain guide when I used a 106 link o-ring chain and a 13/44-tooth combination. Alex from Charlottesville reports that the 13/44-tooth combination works fine with a non o-ring chain. I suspect the non o-ring chain is a looser fit and gives the extra clearance needed. The two-hole aluminum chain guide brace from Baja Off Road Tours and Products is a perfect fit. I have always liked the ICO odometer/speedometer and magnetic pickup in lieu of the Honda mechanical speedometer and cable. Remove the speedometer cable from the speedometer assembly and remove the speedometer assembly. Remove the bulb sockets from the base of the speedometer assembly. Remove all bulbs. Slide the sockets into a rubber tube and zip-tie the tube to the headlight mounting bracket. Remount the headlight bracket using two bolts (6x25 mm), nuts, and collars. The collars can be taken from the rear turn signal assemblies, if the turn signals are not used. Mount an ICO or similar unit on or near the crossbar. Carefully cut and remove part of the plastic protective layer from a metal braided brake line (`86 XR250R) . Cut and remove from just above the lower brake line mounting clamp to about 1" above the upper brake line guide. Make sure the forks are fully extended by putting the bike on a stand. Cover the brake line and the ICO pickup wires in their protective sheath with a brake line protector that has been trimmed to fit. Tape or zip-tie each end of the brake line protector. Tape the remaining exposed ICO pickup wires to the brake line, all the way to the brake reservoir. See the ICO installation instructions for more information. Make a mount for the ICO pickup unit and clamp it to the lower fork leg. Mount the ICO magnet on the plastic wheel hub cover. Remove the Honda mechanical sending unit from the front axle and replace it with an XRs Only speedo drive replacement unit. In the rear, we stuck with the stock spring with 85-95 mm of sag, 6-9 clicks clockwise from full soft for the compression damping, and the number 1 setting for the rebound damping. We each weigh about 180 pounds nekid. Neither of us rides our XR-Ls too aggressively; we have other bikes for that. For more aggressive riders, XRs Only sells Progressive Suspension fork and shock springs in higher spring rates than stock. I wanted some tires that were better in the dirt than the stock Yokohamas. Everyone I talked to raved about the Gran Sport GS-10 6-ply tires. I installed a 3.25-21 and a 4.60-18 with heavy-duty Metzeler tubes and Honda rim locks. I liked the Gran Sports much better than the stock tires. Later, I switched to a DOT legal Pirelli MT-17 Gara Enduro 110/90-18 rear tire with more aggressive knobs, which I like even better. Gordo opted for full knobbies and installed Pirelli Sand Cross 3.00-21 and 4.25-18 tires and heavy duty tubes. The June `92 issue of Trail Rider has an article about dual sport tires. The article discusses the latest DOT tires from Pirelli, Metzeler, Bridgestone and others. I like handlebars that are a little taller than most bars these days because I have short arms, and I like to sit up a little straighter while riding on the street. I also don't like the stock white XR-L bars. I mounted a set of K&N YZ bars. The higher bars have a longer cross bar, allowing me to mount my mirror, Enduro Jug, and ICO speedo/odo all on the crossbar. I cut the bars to 30.5" wide. Gordo kept his stock XR-L bars. Remove the plastic hand guards and replace with aluminum hand guards. The standard clutch perch is not a split perch. I replaced the entire assembly with an `89 XR250R clutch perch and lever assembly. You can't use the stock mirror with the new perch. I removed both mirrors and mounted a very small bicycle mirror on the crossbar. I have to twist a little to see everything behind me, but I really like the small mirror. Use an NGK DPR9Z spark plug, the same as the XR plug, if you do any of the intake, carb, or exhaust system mods. Remove the resistor in the spark plug cap and replace it with a piece of stainless steel. I cut the head off of a #10-24 stainless steel bolt and cut the bolt to the right length. As a side note, the September `83 issue of Cycle World had an article that advised using a brass or copper rod as a replacement for the resistor. I did just that in my `86 XR250R. Just out of curiosity, I checked the brass rod in my XR to see what it looked like after five years of use. It was black and had a very high surface resistance. An engineer buddy told me that brass and copper oxidize at high temperatures. The new advice from my engineer buddy is to use stainless steel. I don't plan to ride in the rocks very much with my XR-L (I'll use my XR for that). I mounted a blue plastic Maier skid plate over the stock aluminum brush guard. Gordo plans to ride everything with his XR-L, so he's holding out for an MS red anodized aluminum skid plate. It completely replaces the aluminum brush guard and is the hot setup for rough riding. In early `92, Gordo, of the NASA budget, had Powroll do a 330 cc bore and stroke job on the XR-L for about $500. After a dyno run, he put in a main jet three sizes larger but otherwise made no other changes. Gordo says the bike isn't appreciably faster. However, on steep, gnarly hills, it never runs out of bottom end, and pulls and pulls. In the interest of reducing weight, Gordo and I scoured every inch of the bike, looking for extraneous parts to remove. Remove the turn signals and reflectors. Remove the turn signal relay and rubber mount. Disassemble the turn signal switch and remove the little turn signal lever. Cover the opening in the switch. Remove the seat strap and grind off the captive nut brackets. Remove the engine run switch. You can use the ignition key to stop the engine. After disconnecting the switch wires, connect the remaining male and female ends on the main harness together. Remove the push throttle cable. You have to readjust the pull cable quite a lot (I can't figure out exactly why). Remove the helmet lock bracket and be careful that you don't grind into the frame tube too deep. In lieu of the lock and cable, I installed a metal grommet on the flap of the tool pouch and a small Master lock to keep out curious fingers. Remove the passenger pegs and brackets if you don't plan to carry passengers. Remove the heat shield on the exhaust header. Cut out the upper and lower indented areas on the plastic front sprocket cover to allow mud to get out easier. Remove the kick-start-activated compression release cable. As I discovered on my XR, it's easier to find top dead center and start the bike with this cable removed. I was always pushing past TDC because there wasn't enough compression resistance to my heavy foot. Remove all the little brackets that hold the cable. Gordo did all that and more. He removed the pivot arm that pushes on the exhaust valve from the valve cover. He plugged the hole with a high temperature rubber plug and covered the outside with gray epoxy, so it would look nice. Someday when I have the right-side engine cover off, I'll take off the extra junk on the kick start shaft that activates the lower compression release pivot arm, as I did on my XR. I removed the small brake-light switch mounted on the front brake lever assembly because I use the front brake a lot and don't want to distract people riding behind me (heh heh heh). My XR-L weighs only 4 pounds more than my similarly stripped `86 XR250R. I like my Hondas to be red and blue; Gordo likes them all red. There is something out there for both of us. We both installed stock Honda red fenders, front and rear. I kept my blue fork boots; Gordo opted for red ones. Someday I'll paint the frame red, but for now I use PJ-1 Honda white paint to touch up the places on the frame where I broke off all the clips and mounts as I removed parts. I painted my headlight nacelle red and retained the blue number decal. Gordo left his headlight nacelle white and peeled off the number decal. I removed the side number plates because I didn't think they did anything functional, and they are expensive to replace. I made an air box cover out of blue plastic and stock Honda fasteners. I discarded the inner air box seal. I would like to install a Roost Boost Plus, but Answer did not know if the XR version would work on the XR-L. The one on my XR works great. I'll probably add some Enduro Engineering aluminum hand guards. If the clutch springs wear out like they did on my XR, I'll install some White Brothers heavy duty clutch springs. I plan to make some mounting tabs to mount an Acerbis headlight guard. Roost Boost Plus Chap 407-1050? How did the bikes turn out? In a word, great. Both Gordo and I find our XR-Ls to be great fun. Did we miss anything? No doubt. Now you can have fun trying to find your own things to change and/or remove. Although they were not mentioned herein, Thumper Racing has XR-L performance kits and accessories; their number is 800-259-5186. Give them a call to get one of their free catalogs. p.s. I sold the XR and XR-L, long ago.